When I first learnt how to make hand-stitched lampshades I was told, “You really should use a thimble – and one day you’ll wonder how you managed without one”. Well, I found them really uncomfortable at first; they made sewing feel really awkward. But now I fret if I can’t find my Nan’s old thimble that was in her sewing box I inherited years ago. It fits perfectly and really saves my fingers from all those nasty pins! 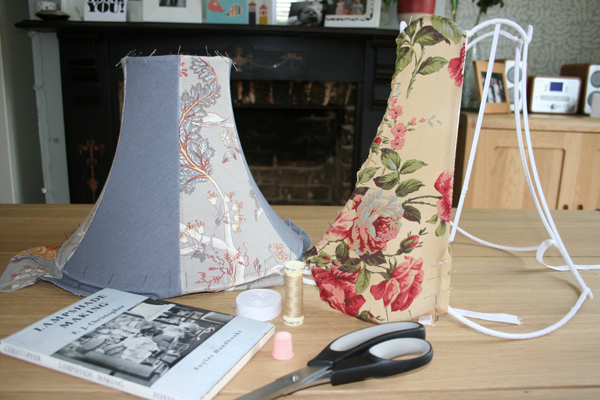 This week I have finally had a go at making paneled hand-stitched lampshades. There are two ways of making them – 1. Cutting fabric to fit the panels and then stitching them together on the sewing machine (on the left in the photo), and 2. Sewing the panels to the frame directly by hand and then neatening off the joins with some kind of braid. Both work really well, but made me realise how important it is to choose the pattern for your panel and fabrics that compliment each other nicely. The second method is definitely more time consuming, but okay if you want something to do while watching TV in the evening. Both involve a lot of pins, thank goodness for my Nan’s thimble eh? !